Tony Lembke is a GP in Alstonville, NSW, Australia. He is chair of the North Coast Primary Health Network. Tony is a Clinical Advisor and Chair of Faculty for the Improvement Foundation and Clinical Director of the Australian Primary Care Collaborative Program. This is a national program that has improved health outcomes by facilitating proactive and systematic care in general practice, and by increasing accessibility to primary care services. He is also executive director of the Australian Centre for the Medical Home and the Person Centred Care Collaboration..
Tony has a strong interest in Health IMIT, having been Sydney University Medical School Donkey Kong Champion in 1983. He served as a NEHTA Clinical Lead and chaired the national eHealth collaborative – the ‘eCollaborative‘. In 2007 he was awarded the John Aloizos Medal for Outstanding Service to the Australian Divisions of General Practice, and in 2013 won the National Medicare Local Individual Distinction Award. 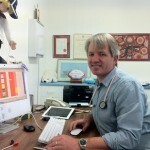 He is the 2012 RACGP ‘General Practitioner of the Year’. He is also an ever optimistic coach of the Lismore U16 Rugby team.